A delightful comedy that stars two-time Academy Award winner Sally Field as Doris, a shy accounting clerk who has never ventured out of her comfort zone and lives vicariously through her colorful daydreams. Life throws her a curveball when a new co-worker, John (Max Greenfield), joins the company. Doris is inspired finally to take control of her life, and her newfound courage takes her on an extraordinary adventure more exciting than anything she could dream up. Two weeks ago my friend Nancy and I went out to eat and saw the movie Hello, My Name Is Doris. I’ve loved everything I’ve seen with Sally Field so I was sure I’d love this movie. Doris has spent many years taking care of her ailing mother so she’s very much an introvert who only has a few friends. When her mom passes, she attends a self help seminar. She tells the host she has feelings for her new coworker but thinks it’s impossible for them to have a relationship. He tells her nothing is impossible, and instead to change the word impossible to I’m possible. That starts a change in Doris who breaks out of her shell and becomes a very quirky new Doris. She starts getting dating advice from her friends 13 yr. old daughter. Things go from funny to hilarious as Doris makes her way out of her shell. The ending left room for a sequel, and hopefully one will come out soon. This was one of the best movies I’ve seen in a long time. 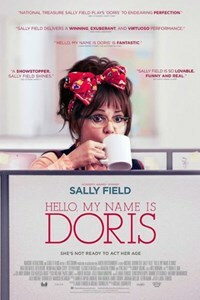 I love Sally Field and she played Doris perfectly. If you haven’t seen this yet, I hope you decide to. I love it! This looks and sounds adorable, Vicki. I am also a fan of Sally Fields. I love Sally Fields but haven’t seen this one. It sounds like a fun watch. Adding it to my movie list! I’m so glad you enjoyed it and that you reviewed it. I haven’t heard of it but it sounds like something I’d like. You know I loved this too! I sure hope they make a sequel. I so want to see this! Our local theater doesn’t have but our arty theater was showing it. I’ll have to see if they still are! Might be a good Mother’s Day afternoon activity with my mom.